We are a leading personal injury law firm when it comes to retrieving compensation for accidents on the road, in the workplace, on public footpaths, on private premises and more. If you’ve been injured in any way whatsoever and it wasn’t your fault and you’re in the East Kilbride area – give our personal injury solicitors a call today. We will offer you the very best legal representation you can find. We do our utmost to remove all the complications and confusing elements of personal injury claims so that you can understand all the information surrounding your specific case. We provide comprehensive consultations and top quality legal advice completely free of charge, with all our staff trained to provide the very best in customer service. We have been operating in the personal claims industry for several years, and boast a team of superb solicitors all capable of supporting you or any family member who has fallen victim to an accident – regardless of how it might have occurred. We pride ourselves on putting the client first and offering a tailored service that caters specifically for each individual client. There is simply no other legal firm quite like us, as we strive to make the personal injury claims process a straightforward one at every single turn. Our local team of personal injury solicitors for East Kilbride are capable of covering a wide variety of claim types. If you do not happen to see your case in the list below, feel free to give us a call and explain what happened during your accident. If we believe your injuries were caused by another party, there is a strong chance that we will be able to claim back financial compensation for you – no matter how the injuries were sustained. Accidents in public places including slips, trips, and falls. Injuries sustained in the office environment (e.g. Repetitive Strain Injury). Injuries sustained after falls on construction and building sites. Injuries sustained whilst on holiday. Injuries sustained from road traffic accidents. Injuries sustained from malpractice/medical negligence. We offer a No Win No Fee personal claims service for most cases. We assess and evaluate each individual claim on its own merits in order to determine whether there is an argument for a financial compensation settlement. Once you’ve got in touch and we’ve discussed what happened during your accident, we will inform you whether we believe you have a case. If you do and you agree for us to represent you from this point onwards, the claim remains in our hands and we will take care of everything – from the paperwork to the negotiations – allowing you to continue with your life as normal and giving you opportunity to recover from any injuries that you may have sustained as a result of the accident. Making a claim with us couldn’t be easier. Once we have established the full facts surrounding your accident in East Kilbride or elsewhere and determined that you have a viable claim, we will proceed to write a claims letter to the party who we believe is responsible for causing your injuries. This could be a driver who has crashed into your vehicle, an employer who has failed to supply safe work equipment for you to use on the job, or an organisation who has behaved in negligent manner by failing to provide secure footing on private premises. We will also contact a series of medical professionals to fully determine the extent of your injuries. In most cases, the defendant will have three months to respond to our letter, although in the majority of circumstances they will reply long before the final deadline. If the defendant admits liability for causing the accident, we will proceed to discuss with them an appropriate compensation amount. If they deny responsibility or any wrongdoing, the matter could be taken to court, where our professional solicitors for East Kilbride will eloquently argue your case in the presence of a judge. Court settlements are rare, but we are prepared for their eventuality and will offer you the very best legal representation in the event they should occur. Once we have examined your personal injury claim, we’ll be able to provide you with an estimate of the amount of compensation you’re likely to receive. This may vary if the nature of the case changes in any way, but our personal injury solicitors are very experienced in this field and know the kind of fees you can expect to receive for specific types of accidents. 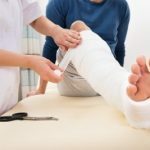 Many people who have suffered an injury at work feel uneasy about making a claim against their employer as they feel it may place their job in jeopardy or force their employer to look at them in a bad light. Rest assured that you cannot experience any fallout from making a claim following an accident in the workplace. The law forbids organisations from discriminating against employees who have launched a personal injury claim against them for injuries they have suffered on site. It is your right to claim back money for any injuries you might have received if your employer has behaved in a negligent manner, and you should never feel concerned or apprehensive about making a claim. Contact our East Kilbride personal injury team today to get your compensation claim started. Our legal advisers will be happy to answer any questions you may have, and will be delighted to set up a FREE consultation with one of our professional personal injury solicitors at a time convenient for you. You shouldn’t have to cope with your injuries all alone. You deserve the kind of compensation that is able to get you back on your feet and begin your life once again. Contact us today and we can help to put things right by getting you the compensation and justice you are entitled to and deserve.